It all started with a challenge issued by Samsung; Build the next great intelligent assistant integrating to Bixby. It was a pretty tough mission considering an integration to the brand-new second version of the intelligence platform hadn’t been done before. However, we managed to build and complete a spectacular prototype that was showcased at the Samsung Developer Conference in San Francisco. Ten other companies participated as well, including Yelp and Spotify. Geoffrey Wong, Partner Engineer at Samsung Electronics Mobile, has been the link between FirstAgenda and Samsung in the development process. He is very positive about FirstAgenda’s work. Samsung chose FirstAgenda to be one of a select few partners to create a Bixby Capsule as part of the Private Beta program. Their approach to increasing productivity by streamlining meetings is refreshingly innovative and a welcome tool for any office workers who dread meetings. The FirstAgenda team was thoughtfully engaged from the beginning and was immediately productive in prototyping a Bixby Capsule that implemented a wealth of features including: user authentication, meeting search, decision and note lookup, and action item management. TIP! Watch a demo video of the Bixby Capsule in the end of this article. Bixby is a voice recognition technology that is much more conversational than other voice assistants. It responds to natural language instead of just trigger commands as we know it from Alexa and Siri. Bixby works with third parties like FirstAgenda and can thereby help the users in countless ways as a voice-activated personal assistant. FirstAgenda is the world’s first Meeting Optimization Platform and the integration to Bixby provides even greater value for its users. 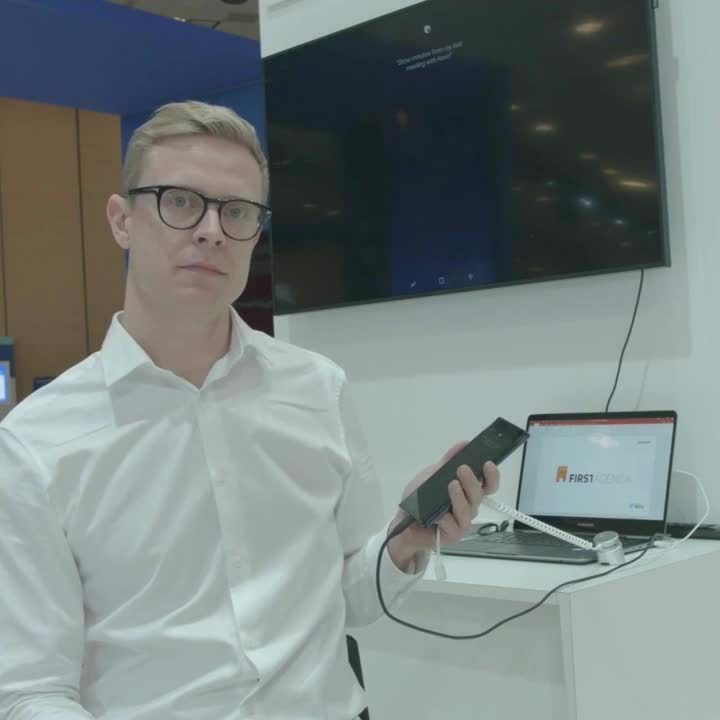 Watch FirstAgenda’s Head of Product, Søren Kyd, talk about the development of the prototype and the feedback in the video. FirstAgenda’s Meeting Optimization Platform assists the user in various meeting situations – from preparation to execution and follow-up. We approached the challenge from Samsung by going through all of our features thinking “How can we make a prototype that allows users to really benefit the most from our service and the new possibilities with Bixby?”. This resulted in three use cases which were the focal point of our development. The prototype allows you to simply ask Bixby to show your uncompleted tasks in FirstAgenda. The voice assistant will tell you how many tasks you have on your to-do list, what they contain, the due date of the tasks and which ones are over-due. You can even complete the tasks on the fly. You just have to ask Bixby to open the minutes from a specific meeting and the assistant will display the minutes from FirstAgenda on the screen instantly. The meeting minutes contain an overview of the meeting's most important keywords. In addition, they highlight your decisions, tasks and photos – as well as personal notes. This makes it even easier and quicker to refresh your memory from last meeting before you enter the new meeting. Ask Bixby to add a task to one of the attendees at your meeting and simply speak the task out loud and add a due date. Bixby will then add the task to the minutes of the meeting without you having to open the FirstAgenda app. At the Samsung Developer Conference, we got a change to showcase the prototype to Eui-Suk Chung, EVP and Head of Software and AI, Mobile Communications Business at Samsung, and he really liked what he saw. In general, the feedback from the participants was very positive. People were amazed at how far we’ve taken the app in such a short time. The partnership between Samsung and FirstAgenda came out very successful. Geoffrey Wong is truly impressed with the team and he looks forward to continuing the collaboration. The development team at FirstAgenda executed features ahead of schedule and were delightful collaborators. In fact, their professional developers embraced Bixby’s approach to natural language and were vocal proponents in Samsung’s growing developer community. When Samsung launches the Marketplace, FirstAgenda’s capsule is expected to be very popular for anyone interested in improving their office productivity. However, there’s still quite a lot of work to do before the capsule is ready for the users. At FirstAgenda we’ll continue to work on the capsule to make sure it is ready when Samsung to open up their Marketplace in early 2019. ..and in the meantime, you can get a free demo of our Meeting Optimization Platform. Schedule a time with one of our consultants when it fits into your calendar.